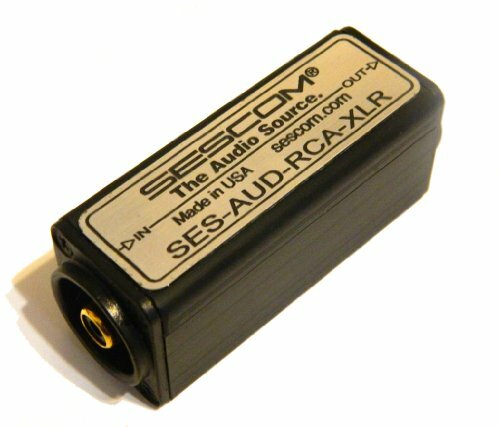 Sescom SES-AUD-RCA-XLR is a single channel unbalanced to balanced prosumer audio converter. Housed in a robust anodized aluminum enclosure with Neutrik chassis mount XLR and a recessed Neutrik RCA that you can hide in your hand, this converter delivers incredible sound quality and requires no power. With a world famous Sescom audio transformer inside, the SES-AUD-RCA-XLR assures the high quality and reliability that make it a must have for any gear bag or audio tool box. Designed to interface equipment such as cassette players, CDs, turntables, digital video discs or similar unbalanced equipment to interface with professional balanced 600 Ohm (relative) systems such as digital editors, ADAT & other broadcast equipment. Specifications: •	Frequency Response: Line level 20hz to 20khz •	Gain/Loss: 0dB In To -6dB Out *Perfectly Balanced Output Phases! •	Body Dimensions of Housing: 3" X 1.25" X 1.25"
If you have any questions about this product by Sescom, contact us by completing and submitting the form below. If you are looking for a specif part number, please include it with your message.